We took the time to get to know the owners of Mydas Photography, their company ethos, understanding of web technologies and their goals for the business. This allowed us to build a new website for them that has increased sales and made their job easier. Mydas Photography came to Mighty Designs because they didn’t feel that their website was getting them enough clients and they’d heard about a thing called “blogging” that they thought might enable them to connect better with potential customers and bring in more business. 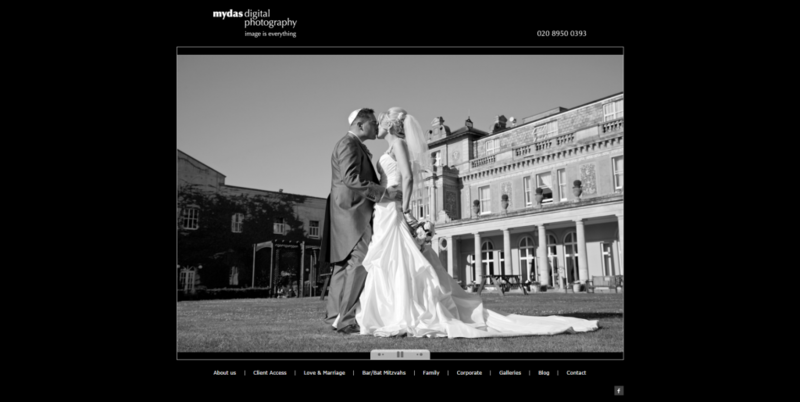 In getting to know the owners of Mydas Photography we found that although they were broadly happy with how their current website looked, they were starting to see its limitations and knew it should be working harder for them. As dedicated photographers, they didn’t want to have to spend lots of time managing a complicated website but they did want to be in complete control. We ensured that Mydas Photography got a solution that would be easy for them to understand and manage themselves once we had set everything up, taught them how to use it and handed over control. Their specification was to replicate the look and feel of their old website on the new system whilst reviewing and updating all of the text, photographs and client area. Because business for them is ongoing, it was important that we were able to do everything “behind the scenes” so that they would have continuity of business and customers wouldn’t be faced with error pages as we made changes. In the first discussion with Mydas Photography we spoke about the importance of tracking all visits to the website (“Analytics”) so as to understand the way in which potential clients reached the site, the areas of the website they visited once they’d arrived and how they used the site. To make sure that we had early information to base decisions on, the first thing we did after the initial meeting was to put in tracking software on their current site so we could at learn from it as we progressed through the rest of the discovery process. This data would prove invaluable later for defining the layout of the new site and giving a baseline to work from when trying to improve search rankings, average sales per customer and what lead website visitors to become clients. We catalogued, organised and transferred over 35 thousand images in over one hundred galleries across six categories, ensuring not a single photo was lost or misplaced. The page structure was reorganised to make information easier to find. Every single word of text on the website was checked and we worked with Mydas to do rewrites where we felt it would make things clearer, help improve Google rankings or help increase bookings & sales. We installed a blogging system and wrote the first collection of blog posts as well provided guidelines on how best to blog in future. Ongoing monitoring of how the website is performing in Google and how many people visit the site all show significant improvement, and more importantly bookings are up, sales are up and the team at Mydas Photography are now confident that they’ve got a solid base upon which to continue building their business. 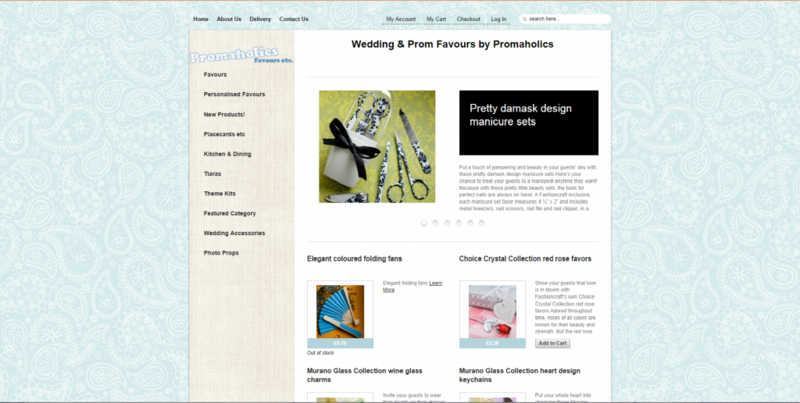 Design, Implementation and Ongoing management of this established Prom eCommerce website has given the owners an easy-to-use way of selling their products to their online audience. After getting to know the scope of website, what the owners were hoping to achieve and what their long term goals for the business were, Mighty Designs made technology and site structure recommendations. These, combined with the “mood boards” supplied by Promaholics formed the basis of the first version of the website used to test assumptions and refine ideas about style, organisation and direction of the website. After agreeing on the site layout and “look & feel”, Mighty produced a prototype site and input over 1500 product SKUs including Title, Description, Images, Product Details, Cost price, List price, Sale Price, Manufacturer, Inventory and Supplier. After minor changes and amendments, the site was approved and the payment system made live ready for the first customers. By following an iterative approach to developing the website and working closely with the client at every step, Mighty designs were able to design and implement a website that met the client’s specification and exceeded their expectations in terms of visitors, order values and, ultimately, revenue generated. The owner of this website contacted Mighty Designs in a panic. He had been phoned by someone visiting his site who told him that instead of seeing the intended site, they were seeing pornographic images. Further investigation showed that users on iPhone and iPad devices were being redirected away from the proper site, with users of all other devices being able to view the site as normal. The hacker was able to gain control of the website because the owner of the website was using old, outdated versions of WordPress, themes, plugins and scripts to run his site and hadn’t taken sufficient precautions to protect against attack. Once the hacker had gained access, he had modified many core and theme files and had not only modified the website’s behaviour but had left it wide open to further attacks from himself or other hackers. Mighty Designs was able to quickly diagnose the problem, put a temporary solution in place so customers would be redirected to the owner’s official Facebook page and then provide a complete solution involving removing malicious code. By upgrading all software and plugins, securing the server through the use of stronger passwords and changing permissions to limit access to folders on the server the future security of the site was ensured. Mighty Designs also installed monitoring software to track and prevent further hacking attempts and vulnerabilities as well as putting in place a proper website backup regime for peace of mind. The ongoing administration and upgrading of this busy website by Mighty Designs, including all SEO work, the management of over 350 thousand photographs and implementation & support of the newsletter marketing system has enabled the client to grow their business and have more enquiries than they can handle. When we took over the management of Peasy Photos’ website, it had been set up well by the previous design team but just wasn’t working hard enough. To improve the customer experience of the site and increase revenues for the business owner, we have fully patched and updated all systems, implemented an interactive feedback and suggestions service, a newsletter “autoresponder” system and we are currently working towards full mobile & tablet compatibility through the use of responsive design updates to the previously non-mobile ready theme. Behind the scenes we have undertaken article and blog post writing to increase Google rankings, subtly reorganised various bits of code and site structure to help with SEO, provided video editing services and installed a video player system showcasing customer testimonials. For the site’s eCommerce, we put in place an order handling system to enable the business owners to quickly process hundreds of photo orders per day and written custom scripts to streamline this process. Additionally, we created upsell systems and methods to increase revenues from each customer as well as rewriting instructions, FAQs and product descriptions to reduce customer service queries and we have configured a customer records management system which is integrated with the email platform to enable the tracking of customer service issues, client enquiries and bookings. A full analytics suite enables the tracking of everything from how visitors reach the site, what they do whilst on the site, where on the page they click, how long they spend on each part of each page and much more. All this data further informs our understanding of how the users interact with the website and enables further refinements as time goes on.